The Clark Reliance hand wheel gage valve is designed specifically for floor level columns in low pressure systems. Time tested design and manufacturing assure dependable performance. Available in 1/2" npt and 3/4" npt models. The Clark Reliance weighted gage valve is a high performance self-closing unit that provides leak proof operation at moderate pressures. Pull chain to open, Release chain to close. Precise weight distribution for tight shut-off. Twelve-Position weight level allows for best location. 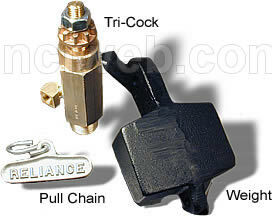 Weight lug allows for use of optional shut off chain. Accepts maximum "open" chain length of 25 feet (unless open chain is also attached to closed weight lug). Discharge nozzle directs steam/water away from operator. Clark-Reliance Gage Valve Models GC450 and GC451 feature a stainless steel stem and seat component to assure positive seating and long service life. Integral stem discs are precision machined to glass smooth finishes. Pull left hand chain to open, right hand chain to close. Multiple-thread stem design provides fast response. Integral "stop" prevents dead-center vertical lever position. Eighteen positive, non-slip lever positions offer a correct lever angle regardless of the stem's position when turned tight. Geared sprockets fit onto flat-sided stem ends. Lever gears nest securely into sprocket gears. Stem nut secures the lever. Under the most severe boiler system conditions, Clark-Reliance Gage valve Model GC302 dependably resists the damaging cutting action of steam and water. Reliability and long service life are the results of quality materials, precision manufacturing and 150% hydrostatic testing of each unit. Available in ¾"NPT Model Only. Pull left hand chain to open, right hand to close. Stainless steel seat is precision machined in an exclusive Clark Reliance process. Seat is sealed tight in the shank with 1/8" pipe thread - easily renewable. Multiple thread stem opens/closes in ¼" turn and can not unscrew under pressure. The multi-slotted operating lever allows a wide choice of open/closed positions. Each lever position is held in a non-slip design of nesting sprocket and lever gears, secured by a stem nut. Hand Wheel Operated Models for pressures to 150psi at floor level locations. MODEL SIZE NPT OPERATION MAX PRESSURE FIGURE NO.